Your HVAC system not only helps maintain an optimal temperature inside your building, but also prevents dust particles and other harmful contaminants from entering the interiors. A malfunctioning HVAC system, however, is more of a liability than an asset and fails miserably at performing its job. Additionally, a dysfunctional HVAC system can cause mold growth. More often than not unclean ducts are the culprits behind malfunctioning HVAC systems. Getting your HVAC system and ducts cleaned regularly pays dividends in the long run. Not sure about whether to get your system cleaned regularly? We, in this post, will give you not one but four reasons to show some love to your HVAC and duct. Take a look. With time dirt, dust particles, mildew, mold, and allergens settle in and around HVAC ducts. The system circulates these particles with air. 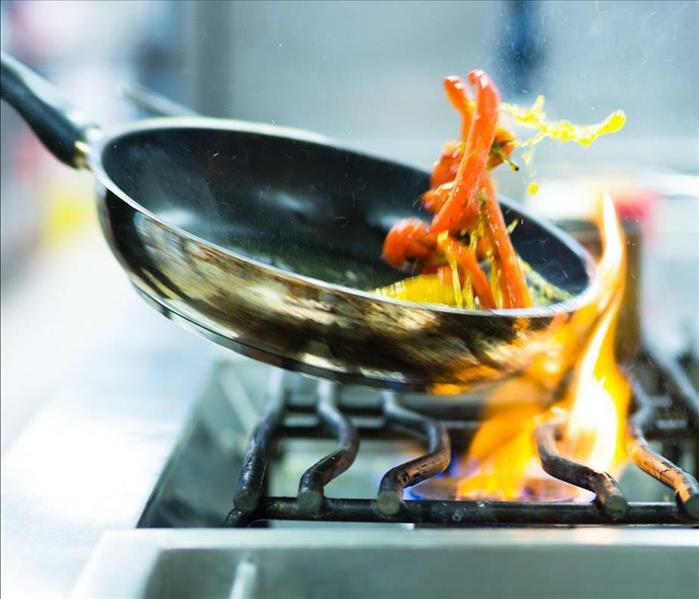 Inhaling air laden with these contaminants can give rise to a number of health issues such as skin allergies, asthma, and other respiratory conditions. Your HVAC's filter cannot trap all these contaminants, which is why it is necessary to get your ducts cleaned regularly. Unclean and clogged ducts drag down your system's performance and can result in high energy bills. Cleaning ducts regularly help improve the airflow, which is one of the essential prerequisites for ensuring flawless performance. Studies suggest that 9 out of 10 systems do not last long due to improper or inadequate maintenance. Getting your system cleaned regularly not only adds years to its service life, but also helps avoid costly fixes. Getting your system cleaned regularly can expose underlying mechanic and other issues before they snowball into major concerns. HVAC systems with unclean ducts often circulate stale air with a strong metallic or musty smell. Moisture builds up in the duct often results in a burning smell. To maintain the quality of life, contact an HVAC repair expert who will perform a thorough checkup and address system issues. SERVPRO of Harford County is a trusted leader in the clean-up and restoration industry. We are NADCA certified and have completed HVAC and duct cleaning for both large and small commercial facilities. Please give us a call directly at 410-679-6260 for an estimate to help improve the efficiencies of your property. SERVPRO of Harford County was quick to respond to the aftermath of Hurricane Florence's destruction of the Carolina Coast. Our crews were called into help restore eight condo buildings on the coast of North Carolina which suffered varied degrees of water damage from the storm. Our team walked each and every room of the eight buildings affected with a member of the condo association board. We worked with them closely documenting the steps to be taken to restore their buildings and educating them on the process along the way. Each room had varied degrees of damage and so a thorough and detailed scope of action was necessary. Our team continued to work very closely with the condo association board and property manager keeping them up to date and fully informed on our daily progress for the duration of the project. "SERVPRO was onsite less than 24 hours after contacting them, ready to work...they were able to scope the damage in all units and begin placing drying equipment within 48 hours of arriving onsite. Demo of wet and damaged areas began shortly thereafter and was extremely organized. The SERVPRO staff was courteous and worked amazingly well with my owners and guests onsite. They made a huge job, and even bigger mess, something manageable. I highly recommend them because of their professional attitude, meticulous work ethic, and unmatched experience." At SERVPRO we are not only dedicated to helping our customers get back to their lives after a disaster, but we also feel it's important to educate our customers so that they can make informed decisions. Mold is a common problem that most homeowners in the area deal with. What is mold? They are a type of fungi that exist everywhere and only need moisture and a compatible surface to survive. There are at least a hundred thousand different species of mold. While some types of mold are benign, some other types can be toxic. To address mold growth, it’s important to know the different types of mold you’re dealing with. Each one comes with its unique characteristics, and growth patterns. It’s also important to know what areas are attractive to mold in your home. Acremonium: Found on dead plants and soil, it grows indoors on paper and drywall tiles. Alternaria: This mold is very commonly found on food, plants, rotting farmland manure and is resistant to most fungicides. Our technicians receive advanced training to deal with your mold issues. When you are looking for the best mold remediation services, SERVPRO is the only name to trust. Committed to providing excellent remediation and restoration services, SERVPRO has the dual advantage of highly trained staff and cutting edge technology. 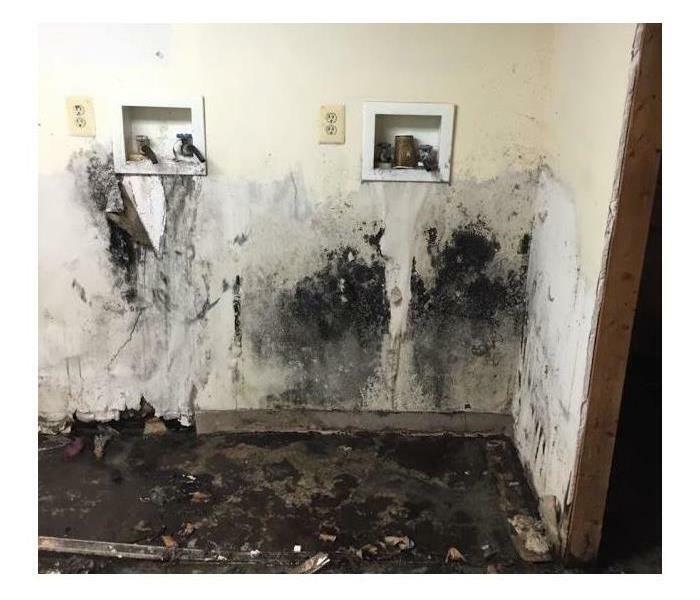 Whether you're in Bel Air, Fallston or Forest Hill, flooding of basements is one of the most common issues most homeowners face. Although flooding occurs during the rains or rapid snowmelts, it can also occur in dry weather. 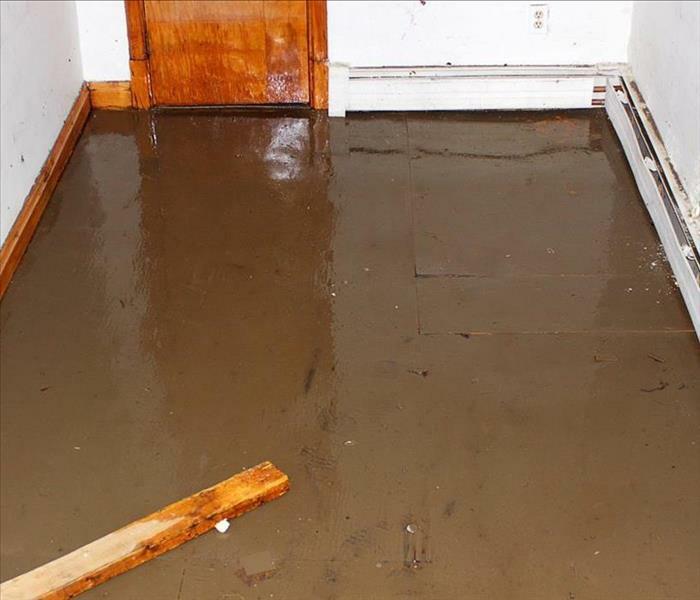 There are many reasons for basement flooding including seepage, storm sewer backup, improper sloping and others. As the basement lies in the lowest level of a building, it is prone to flooding. Blocked sewer: If the manifold that connects the public sewer system to your house is blocked it can lead to floods in your basement. It is important to call local authorities immediately to address blocked gutters. SERVPRO of Harford County provides professional cleanup and restoration services on a 24 x 7 basis to ensure your building and basement is free from flooding and other water-related damage. Weather is often the most obvious culprit behind a host of problems including building or structural damage, injuries, mold growth, water damage or flood. An ice dam is a common occurrence in winter in areas where snow is in plenty such as the Hereford Zone. 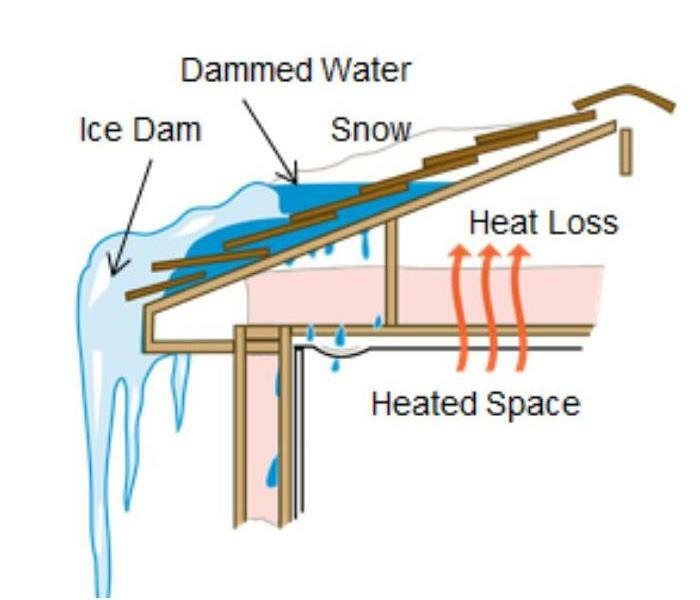 Basically, an ice dam refers to build-up of ice on sloped roofs’ edges of heated buildings. The build up occurs when melting snow beneath a snow pack reaches the roof edge or eave and freezes there. The frozen snow on the eave prevents the meltwater drainage that further builds the ice dam. The backup of meltwater causes water leakage and structural damage to buildings and their contents. Ice dams can also damage ceilings, walls, insulation and other areas. When there are areas of dampness, the risk of mold growth is also high. Along with snow, the outside surface temperature on the roof should be more than 32 degrees F with lower surfaces on the roof being less than 32. When outer surface temperature is more than 32, the snow begins to melt. The melted snow flows down into the roof and reaches the lower surface where the temperature is less than 32 and here is where it freezes forming an ice dam. Ice dams can cause serious injuries and some businesses and homeowners have experienced property damage up to $20,000 because of this phenomenon. Many of the claims are because of property damage that occurred due to pooled water in the ice dam or roofs collapsing. Why choose SERVPRO? SERVPRO is the leading specialist in water removal and clean-up when your property or structure is at high risk of damage from ice damming or water leaks. With state-of-the-art drying techniques and water removal equipment, SERVPRO can help restore the building to its original glory. Every year when winter arrives, homeowners and commercial establishments brace for icy conditions and plummeting temperatures. Close to 250,000 homes experience burst or frozen pipes in the U.S. every year. In fact, SERVPRO of Harford County responded to a burst pipe at a 12 story office building in Cockeysville, MD in the midst of the freeze-and-thaw winter pattern. A pipe broke on the top floor of a 12 story office building affecting every floor beneath it and 30 occupied units. Our team was able to extract and dry the building in 72 hours with minor demolition required. All tenants were able to stay open for business throughout mitigation. The most popular pipe-thawing option is with hot water. Wrap the pipe with a burlap bag or a heavy towel to concentrate heat against it. Place a bucket to catch excess water and pour boiling water on the towel. Some plumbers also advise pouring a big bowl of hot water to which some salt is added down the frozen drain. The slurry acts like rock salt that is used to melt sidewalks that are covered with ice. Repeating this a couple of times can get water flowing again through the pipe. A thaw machine is a portable device used by plumbers to thaw the frozen pipe. The thaw machine provides high currency, low-voltage electricity to thaw the pipe. As sections start to thaw, warm water flows through the ice and melts it. Propane torch with flame-spreader nozzle is used by some, but this can be a dangerous device to use. When not used carefully, the torch flame can ignite or damage wall behind pipe. Placing fireproof material between the wall and pipe can be a precautionary measure. Using a garden hose is also one of the safer options to thaw pipes. Insert a hose as far as possible and feed hot water using a funnel at the other end. Calling a plumber immediately is always the best course of action to prevent serious consequences of a frozen pipe, but if you need mitigation from a burst or frozen pipe, SERVPRO is the trusted leader in the cleaning and restoration industry and has the required expertise, technology and training to handle wide-ranging water damage restoration services. It has always been important for SERVPRO of Harford County owners Jim and Trish Wall to give back to the community. They were thrilled to be a part of St. Vincent's Villa Pancake Breakfast with Santa, sponsored by the Knights of Columbus on Saturday, December 8th in Timonium, MD. SERVPRO of Harford County reached out to friends, family, vendors, and to the public, and boy did they respond! We collected $1,350 which was matched by the company for a total donation of $2,700 for gift cards for the children of St. Vincent's, a comprehensive residential treatment facility for children ages 5-14 operated by Catholic Charities of Baltimore. 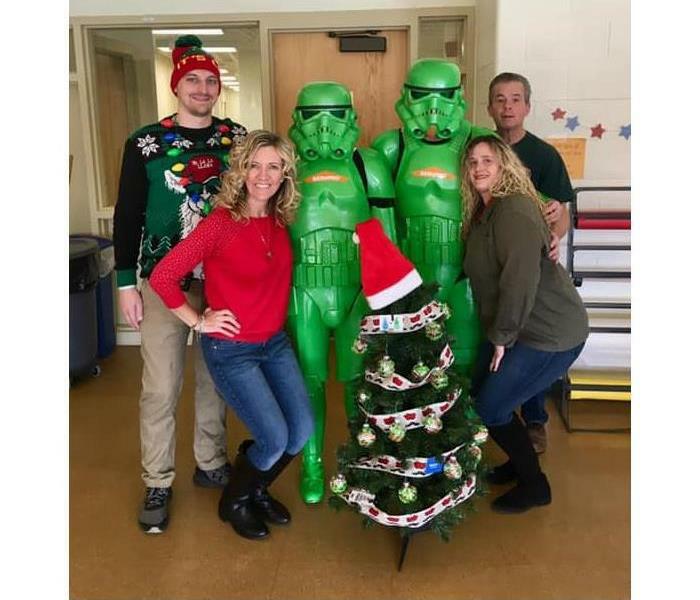 Our generous donors had their names written on ornaments placed on a tree which was presented to St. Vincent's along with gift cards and small gifts by our festively dressed marketing staff, and our very own SERVPRO Storm troopers. As you can imagine, the Storm troopers were a big hit with the children. According to Trish, "This morning was truly one of the most special and rewarding experiences I have ever had. Watching those kids' faces was priceless and getting to interact with them to make them smile was amazing. Thank you all for making this a possibility and I really hope we can make it an annual event." 1/9/2019 - What is Ice Damming?